Be the first to hear about their new releases and deals. Download the Booksprout app and search for Mark Furness today! Mark Furness is an award-nominated writer of thrillers, mysteries and black comedy crime. A former journalist and foreign correspondent in the US, UK, Australia and East Asia, he draws on these experiences to inform his crime stories which often feature journalists. He claims his good characters are based on real people. The black hats are purely fictional. Truly. Mark recently published his first full-length novel, Under Eden. The story features Gar Hart, a journalist with a gun, who probes a murky international underworld of the super rich who will kill to keep their secrets. The investigation starts with Hart's question: why would a billionaire's son steal money and land in prison - then mutilate his lips? The family blames mental illness. Hart might have swallowed the PR line - if the people he quizzes weren't being murdered. Tom Flood, winner of the Miles Franklin Award, Australia's equivalent of the Pulitzer Prize for Fiction and the Man Booker Prize, says of Under Eden, “Gar Hart, a bloody-minded press hack twisting the tail of a leviathan as submerged as le Carré's dark webs. Furness crackles out fire and ice in a wry voice, piles on inventive and ingenious mysteries, body-slams action like it's hot type, and bleeds characters as damaged and compromised as any Child, Connolly, or Grisham." Under Eden was launched as a three-part mini-series. Each of the parts - and now Under Eden, Complete Edition (Parts 1-3) - are available in Amazon Kindle stores worldwide. The British Crime Writers Association Debut Dagger competition long-listed his international conspiracy thriller, with the working title FBEyes, in which journalists uncover corruption at the high-tech frontier of the global arms industry. FBEyes is a work-in-progress. It is the follow-on novel to Under Eden. 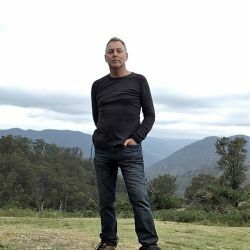 Mark's flash fiction has been published by Apocrypha & Abstractions in the US, and he has been a finalist in Australia’s Cowley Literary Award. Mark’s work is represented by literary agent Clive Newman, principal of the Newman Agency. As well as writing novels and short stories, he has created a black comedy crime series of novellas planned for publication in 2019. Mark is an Australian who lives in Sydney and is married with two young adult children.